The dimensions of your vehicle determine the transportation method we will use, so we will check the weight, height, length, and width of the truck you want to ship. We will also add pick up and drop off locations to the equation. With all this information, we can determine the best shipping method that will meet your needs. 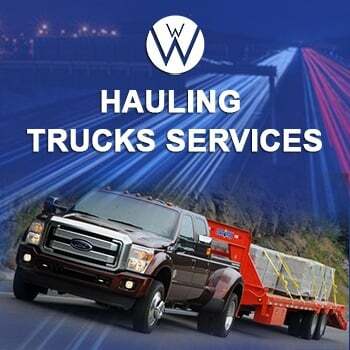 Hauling Trucks, Drive-away, or having one of our We Will Transport It drivers personally drive your car to the drop off location, is also an option. This may be the best option considering the type of truck you wish to transport and the route of travel. Our Hauling Trucks specialists will work with you in deciding the best mode of travel for your truck. There are many different types of trucks, Hauling Trucks and we can transport them anywhere in the continental U.S. or Canada. You can trust our Hauling Trucks experience. Best Hauling Trucks Company in the US. Are you interested in getting our Hauling Trucks Services? Go with the premier name in Hauling Trucks Company! Call We Will Transport It today to get your Hauling Trucks quote! We at We Will Transport It and our Hauling Trucks Services employ fully licensed, bonded, and insured drivers with a clean MVR record. Our drivers are experienced in hauling trucks and can meet your needs. However, if we cannot meet your truck transportation needs, we can find a company that can. We come with a list of bonded, licensed, and insured auto transport companies that may be able to meet your needs better than we would. If you need someone to haul your truck, we can find them for you at a competitive price. We will create a list of companies that specialize in hauling trucks, provide quotes from these companies, and facilitate communication between the client and the shipping company of his or her choice. You get it all: the price you want, your truck transported securely, and the knowledge that your truck will arrive when and where you want it. We Will Transport It will always work as hard as possible to find you a shipping company to meet your needs. If you wish to have a dump truck, food truck, utility truck, bucket truck, light-duty truck, or heavy-duty truck hauled from one location to another, come and see us. We will do the heavy lifting for you(Hauling Trucks), so you can have the truck transportation experience you deserve. We Will Transport It is a five-star Hauling Trucks Services Company, Car Transport, International Shipping Company and heavy load hauling specialist will give you the top rate service for a fair price. We Will Transport It, the Best Hauling Trucks Company in the U.S.